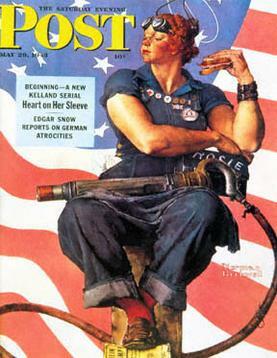 ROSIE the Riveter helped win the war. We don't know how much she earned or how much profit the boss made from her work, but as a symbol of American women working in wartime industry (and doing what had been "men's jobs" ) Rosie appeared in more than one art work, and she earned $4,959,500 in less than an hour on May 22 2002 when Norman Rockwell's painting, originally for a Saturday Evening Post cover, was sold by auction house Sotheby's. Tomorrow evening when Sotheby's holds an art sale at its New Bond Street premises in London's West End there will be some real life American workers and their supporters turning up, though it's meant to be a black bow tie event, and the Teamsters union members and friends are only coming to bid for a fair deal for workers. With unemployment in the UK highest it has been in 17 years, Europe in financial crisis, and Americans so happy with capitalism they are resisting police violence to occupy Wall Street, this may seem a funny time to expect profits from selling costly luxuries like art works. But from the big art houses like Sotheby to the makers of "limited edition" tat and dodgy dealers in stamps, they know that when people with money are not sure of the future their aesthetic interest increases. Some genuine works of art are rarely seen outside the bank vaults. With an annual turnover of around US $774 million, offices on New Bond Street and York Avenue, Manhattan, and more than 200 years in the art business, Sotheby are the big boys. In 1964 Sotheby purchased Parke-Benet, America's biggest auctioneer of fine art, and in 1983 the company was purchased by American shopping malls developer A. Alfred Taubman, who went on to take it public. In 2010, Sotheby’s sales increased by 74 percent to $4.8 billion. And recently, Sotheby’s reported its most profitable quarter in the company’s 267-year history. But despite the record profits and respectable image, Sotheby prefers to act like a cowboy outfit when dealing with some of its workers. An important part of dealing in valuable works of art and looking after them is played by the art handlers. Auctioneers may sell the art, but it is the handlers who transport the items safely and set them up for display. Some of Sotheby's art handlers have more than 40 years experience, handling works of art that sell for as much as $100 million. But rather than recognise the value of their work, and reward them properly, Sotheby has refused to negotiate a fair contract with their union, the Teamsters. The company has locked out its professional art handlers with no paycheck, outsourcing their work to temporary workers. Meanwhile, Sotheby’s rewarded its chief executive officer by nearly doubling his annual salary to almost $6 million. I am writing to ask your assistance on an important Teamsters campaign against the Sotheby's auction house in New York, where a group of 40 workers - mostly people of color - have been locked out of their jobs by an institution that caters to the decadence of the world's richest families, individuals and corporations; and, whose Board of Directors includes the likes of James Murdoch. Sotheby's hired the notorious union busting law firm, Jackson Lewis, to master mind their strategy. Their wealthy clientele sit on the boards of museums, ballet companies and operas. These favorite "charities"
providers of government social services are being cut. One in five New Yorkers live in poverty and the number is even more dramatic for families of color. One thing we have found in our campaign is that the wealthy elite do not want to be called out publicly. We have demonstrated and hand-billed their gala fundraisers and even key auctions. Sources inside Sotheby's tell us this is having an impact on Sotheby's. For this reason we are trying to demonstrate at other Sotheby's locations around the world. On October 13th , Sotheby's London is conducting their biggest auction of the Fall season and we are asking the British labor movement to help us organize a spirited demonstration at Sotheby's so that all auction-goers will at least get a taste of the discomfort that the 40 families of locked-out workers feel by going without a paycheck for two months. Support has come from Unite, RMT and the GMB union, and the the issue of Sotheby's mistreatment of workers is being raised in parliament, as well as by Cities of London and Westminster Trades Union Council into whose bailiwick the New Bond Street premises fall. Tomorrow evening, Thursday October 13 at 6pm the swells arriving for Sotheby's art sale may find themselves meeting a bit of social realism that wasn't mentioned in the company's ad. I'm sure Rosie would approve.